The Lenox signature combination of ivory fine china and shimmering gold creates the classic Eternal 3- piece Flatware Place Setting. 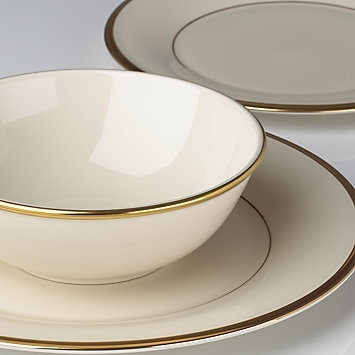 Perfect for a formal or not so formal table setting, this sophisticated dinnerware can also be paired with any ivory bodied, gold trimmed china. The place setting includes dinner plate, salad plate, and bowl. A wonderful way to supplement your Eternal dinnerware collection. Dishwasher safe.